There are many psychiatric drugs prescribed to treat numerous mental and behavioral struggles. Among these medications, sedatives are some of the most abused substances. These drugs induce an intense relaxation and euphoria, which may become addictive for many people. Drugs like benzodiazepines and barbiturates are notorious for becoming the focus of addiction for many people every year – less common are drugs prescribed to treat schizophrenia and bipolar disorder, like Seroquel. Seroquel, the brand name for generic drug quetiapine, changes the balance of two important neurotransmitters: dopamine and serotonin. This medication is considered a second-generation antipsychotic (SGA) or atypical antipsychotic because it functions much like benzodiazepines do in the brain. In fact, it is a dibenzodiazepine, so it is somewhat chemically similar to drugs like Xanax, Klonopin, and Valium. The Food and Drug Administration (FDA) approved Seroquel for prescription use in 1997, so it is fairly new and not widely prescribed. Schizophrenia and bipolar disorder are rarer mental illnesses compared to depression and anxiety. This means that Seroquel is not widely available in medicine cabinets, although it can be purchased illicitly online or through drug dealers. One of the most common methods of abusing prescription drugs is by stealing them, asking for them, or buying them from friends or family with legitimate prescriptions; this is how substances like Adderall and Percocet became so widely abused. They are easy to find, so they are taken for nonmedical reasons. A 2009 article from the Boston Globe pointed out that Seroquel had been prescribed off-label for certain conditions like anxiety and depression, so it was being diverted or sold on the black market to people who wanted to fall asleep. As a strong sedative, quetiapine can cause the brain to black out, and the body to relax. While it doesn’t give users restful sleep, this intense drug can cause a person to pass out and feel more rested if they struggle with insomnia or abuse stimulant drugs like crack cocaine, crystal meth, or prescription stimulants like Adderall and Ritalin. The drug is also very dangerous when it is crushed or snorted. Illicit nonmedical versions of Seroquel are sometimes called Suzie Q or Q-ball. Although Seroquel is harder to find, it has still become a substance of abuse in the decades since it was approved. It is important to take Seroquel only as directed by a physician or psychiatrist, and to take the substance while also attending psychotherapy. Taking any psychiatric medication without therapy will not help to manage symptoms of the mental illness in the long run. Drugs are not a solution to chronic health struggles like mental illness, even if they can temporarily alleviate symptoms. 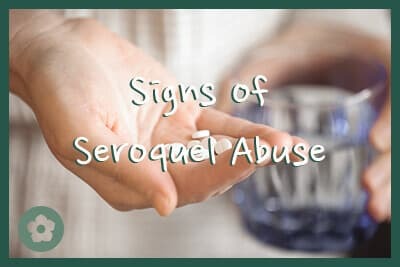 What Are the Signs of Seroquel Abuse? While Seroquel can trigger side effects in people who take the drug as prescribed, a person who abuses this substance is more likely to display side effects. This is because they take a lot of the substance without supervision, and this can cause serious acute and chronic issues. Someone who abuses Seroquel may crush and snort the drug, or they may mix it with water and inject it intravenously. These are extremely dangerous practices that can quickly lead to overdose. Signs that someone is abusing drugs in this manner include redness or dryness around the nose, constant sniffing or nasal congestion, sore throat, hoarse voice, and coughing. Signs that someone abuses Seroquel through intravenous injection include skin infections at the site, track marks, and paraphernalia like rubber hoses, needles, and dirty spoons. Another sign that a person may be abusing Seroquel is tardive dyskinesia (TD) or extrapyramidal effects (EPS). The signs of TD are jerky, uncontrollable movements, often starting in the jaw, lips, and tongue. Someone with TD may appear to be chewing or grinding their teeth. EPS signs include restlessness, physical tremor, and stiffness. Other signs of prescription drug abuse, including abuse of Seroquel, may include needing frequent refills, stealing the drug, stealing money for the drug, or experiencing financial, legal, or social ramifications due to being intoxicated. Substance abuse not only harms the body and brain, it also harms personal relationships with friends and family, makes work or school more difficult, and can lower quality or enjoyment of life. People who struggle with substance abuse may be socially isolated, have poor hygiene, and may end up in jail several times. Although Seroquel should alleviate some of the intense, anxious, and neurotic symptoms associated with mania from bipolar disorder or the psychosis of schizophrenia, abusing the drug causes an opiate-like relaxation. If the drug is taken in larger doses than prescribed or mixed with other substances, especially alcohol, it can cause intense psychotic symptoms or an overdose. If someone overdoses on a drug like Seroquel, call 911 immediately. Abusing Seroquel may be deadly. It is extremely important to take prescription medications only as directed by a licensed physician. Taking someone else’s medication is a crime, and it is extremely detrimental to health. Although abuse of Seroquel is rare, it can be very dangerous. The risk of overdose is high because the drug is a potent sedative. If you are abusing Seroquel, get help from an addiction specialist to safely taper off this medication and then enter a rehabilitation program that provides evidence-based therapy to change behaviors around prescription drugs or illicit substances.